I heart Faces website's theme this week is "Slice of Life." I thought I would share my favorite "life" photo in an unplanned moment. Tessa was just home from the hospital and we were holding her and marveling at all her little features. My Mom had Tess on her lap and I was hanging over my Mom's shoulder taking a picture when Tessa did this big yawn. The last two weeks had been so stressful (if you know Tessa's story, you know how happy we were to get her home from the NICU) and this was just a completely normal, happy, relaxing moment. Head over to I Heart Faces for more "Slice of Life" photos. Oh my goodness...this is too cute. I love little baby yawns. everything babies do is perfect! so cute! That is the sweetest shot. Makes me kind of sleepy! She is a beautiful baby! What a beautiful moment! Love the b/w processing! Congratulations on your new daughter! I love a baby yawn! Aww - oh my word, so adorable!!! absolutely adorable! One of my favorite entries! Oh this is my absolute favorite!! What a precious moment you captured!! You have a lovely baby! 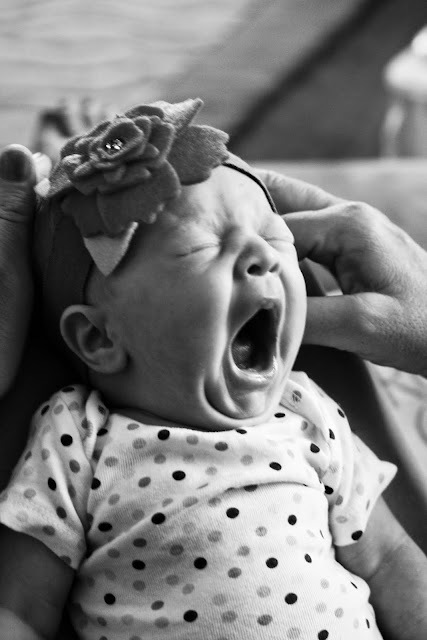 Newborn baby yawns are just too cute. Great capture! Home Date 6: Travel planning.